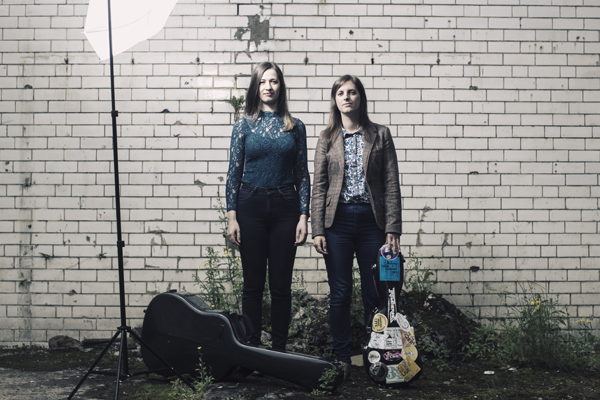 Jenn Butterworth (guitar and voice) and Laura-Beth Salter (mandolin and voice) have each been a presence on the UK folk scene for a number of years. They were brought together by the close-knit and progressive Glasgow folk music community, spending lots of their time jamming an eclectic mix of folk music from across the globe, particularly the UK, Scandinavia and America. The years of playing together brought a deep affinity between the two artists; their rhythms lock tightly, their voices blend so closely that it’s often hard to tell them apart. They have developed a natural telepathy: two musicians bound together. Laura-Beth is a founding member of renowned folk band, The Shee, and has also toured extensively with bands such as Frigg, Shooglenifty and Dougie MacLean’s ‘The MacLean Project’. In 2013 she was nominated for the MG Alba Scots Trad Awards Composer of the Year award after the success of her Celtic Connections commission and debut album, Breathe. Jenn Butterworth is one of the UK’s foremost folk guitarists. She began her career touring worldwide with award winning Anna Massie Band, and has gone on to perform with well regarded acts such as Fiddlers’ Bid, Phil Cunningham and the highly acclaimed Songs of Separation.